Rosy Outlook: Summer Shoes You Need! Happy Friday y'all! Hope you had a great week and have some fun weekend plans ahead. Mine aren't super exciting--I'm mainly going to be working on my final project for my graphic design class since next week is the last week of the course! It seriously flew by! The weather is supposed to be gorgeous though so I definitely want to get some pool time in. 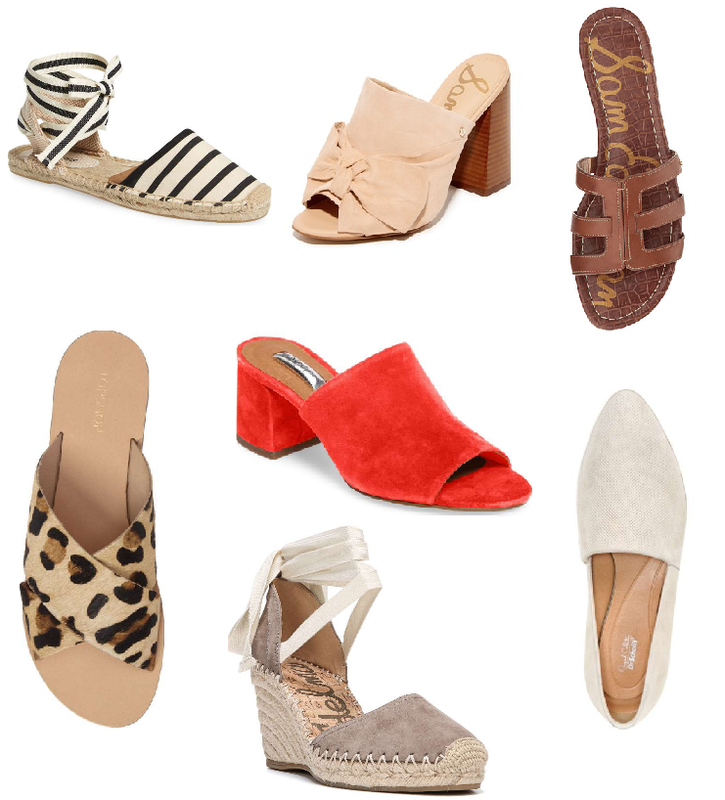 The last few months I have been shoe obsessed and there are so many adorable ones for summer right now! These are a few that I have or have had my eye on! You know I wear my bow mules like crazy but I also wear these red mules a ton. They are such an awesome statement piece. I also wear my Sam Edelman Berit sandals a bunch--I have the gold pair but now I have my eye on these neutral brown ones! Next on my list are the Soludos striped espadrilles--they are SO darn cute and I find espadrilles to be incredibly comfortable. Perfect title cause YEP, I NEED them all...such Cuteness!! Go have a wonderful weekend beautiful gal!! Love all of these! I've been obsessing over the leopard flats but my size is sold out! Love the bow mules that you have, they are so fab! Good luck with your final project and Happy Friday! I keep hoping they'll re-stock the leopard flats in my size! I love them! I have those Sam Edelman flats and love them! So many good shoes. I'm really loving your shoe selection here, girlie; I want all of them, lol! Wow, it did seem to fly by with your class, it seems just like yesterday you shared that you had started the class; I know you'll do great on that project! Thanks for sharing, beauty, and I hope you have a great weekend ahead! What a gorgeous selection! I would like one of each please haha. Have a lovely weekend Kelly. In love! I adore those bow mules the most. Great picks as always! good luck on your course! and loving all these shoes! would wear them in a heartbeat. I love all the mules! They are gorgeous! Such a great selecion!! Love all of these!! I have the striped espadrilles and they are so cute and comfy! Such great picks for summer!